Facebook CEO Mark Zuckerberg and his wife, Priscilla Chan, have hired Democratic pollster Joel Benenson, who served as chief strategist for Hillary Clinton's failed 2016 presidential campaign, as a consultant, according to a new report. Benenson's company, Benenson Strategy Group, will conduct research for the couple's philanthropic undertaking, the Chan Zuckerberg Initiative, Politico reported. Benenson, a former top adviser to President Barack Obama, is not the first politically connected individual employed by Zuckerberg. The move has, not for the first time, ignited speculation regarding Zuckerberg's political ambitions. In January, the couple hired David Plouffe, campaign manager for Obama's 2008 White House bid, to serve as president of the policy and advocacy board. Ken Mehlman, who successfully ran President George W. Bush's 2004 reelection campaign, also sits on the board. "Yet another reason to wonder about Mark Zuckerberg's political aspirations: His philanthropic organization, the Chan Zuckerberg Initiative, just hired the guys who helped elect Barack Obama and George W. Bush," Quartz reported in January. In February, the initiative hired Sen. Tim Kaine's (D, Va.) former communications director, Amy Dudley, as chief spokesperson. Zuckerberg has previously denied any interest in running for office, CNBC reported in January. "No," Zuckerberg wrote in response to a question about his intent to run. "I'm focused on building our community at Facebook and working on the Chan Zuckerberg Initiative." Nonetheless, his actions to hire politically connected officials, and to involve himself in politics, even tangentially, have caused continued speculation. In February, Forbes responded to Zuckerberg's actions, saying that he was "running a political campaign, just not for political office." 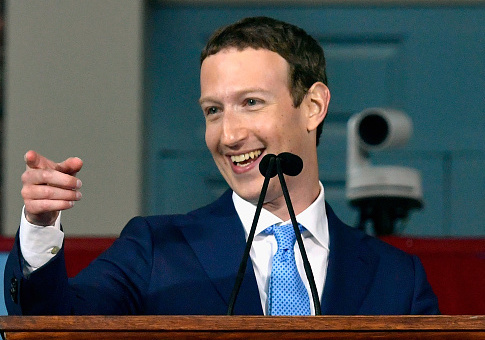 Zuckerberg's name has been floated as a potential 2020 presidential candidate, "along with just about every other billionaire or elected official with half the name recognition of a second-tier Donald Trump adviser," according to Politico. Zuckerberg, 33, stirred the speculation in June when he posted pictures of his road trip through Iowa, the first state to caucus in the primaries, as part of the tech entrepreneur's yearlong project to visit every U.S. state. He has also toured a Ford assembly plant outside Detroit, a key city in the critical Rust Belt state that Clinton lost to Trump; and Dayton, Ohio, the state long considered an election bellwether. "Some of you have asked if this challenge means I'm running for public office," Zuckerberg wrote on his Facebook page last May. "I'm not." Even before his is-he-or-isn't-he road trip, Zuckerberg had shown an interest in politics and social issues. In 2010, he announced during an appearance on "Oprah" that he was donating $100 million to help fix the Newark City public school system in New Jersey. The influx of Facebook cash, however, didn't generate the desired results, and the gift became a nationally recognized failure of good intentions. At least for the time being, Zuckerberg's focus appears to be on working with politically connected individuals in order to further the Chan Zuckerberg Initiative. Zuckerberg and Chan have vowed to give 99 percent of their Facebook shares, worth an estimated $45 billion, to charity. The initiative is endowed with that fortune and is tasked with fulfilling its mission of "advancing human potential and promoting equality." The Benenson Strategy Group "utilizes its Built To Win Solutions to ensure you are equipped to optimize your investments around what matters, answer the tough questions as they arise, and continuously monitor and mitigate the risks of change happening around you," according to the company's website. This entry was posted in Politics and tagged Facebook, Hillary Clinton, Joel Benenson, Mark Zuckerberg, Obama Campaign. Bookmark the permalink.